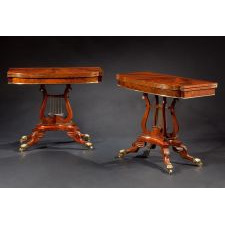 Each with hinged and swiveling, radial, elliptic tops with brass string inlay on the edges above a conforming case with a highly figured frieze and brass molded bottom edge. 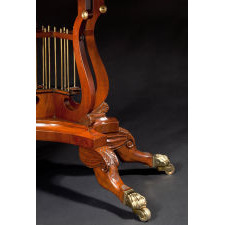 The case raised on a crisscrossed-lyre-form pedestal, the lyres having brass strings, ebony bases and brass bosses at the tops of the harps, the pedestal on a concave plinth raised on out-set animal hocked-legs terminating in brass paw casters. Woods: Mahogany, Ebony, Pine. 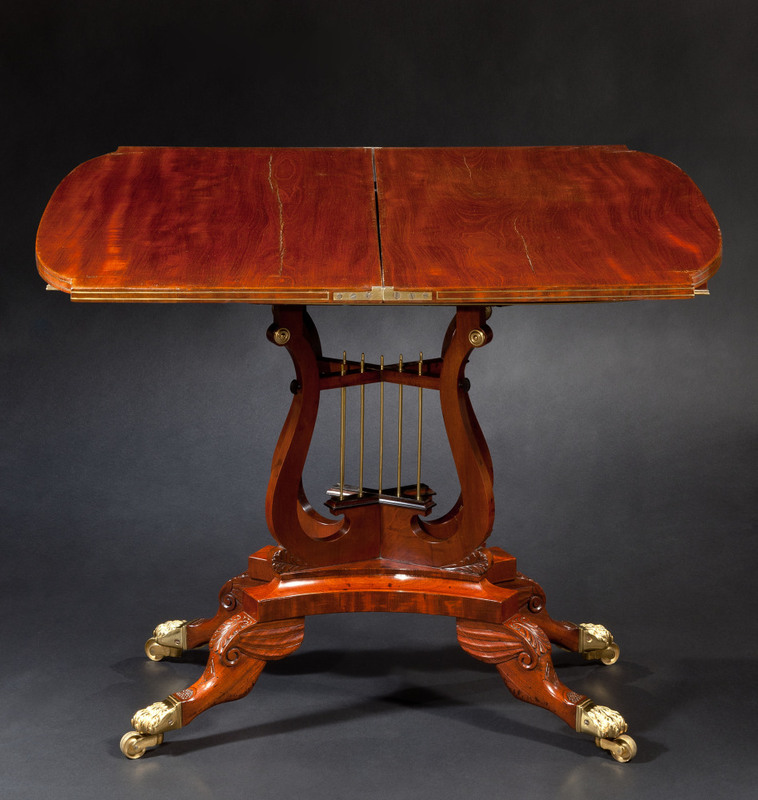 Condition: Excellent: Some replaced brass stringing along the sides of the tops on both tables, a small section of brass molding replaced on the front of each table, four replaced brass bosses, ebony lyre keys and points replaced based on known design, small veneer patches to the edge of the plinths of both tables and various repairs to small imperfections surrounding the inlaid brass strings. Brass paw casters restored to their original lacquered appearance. 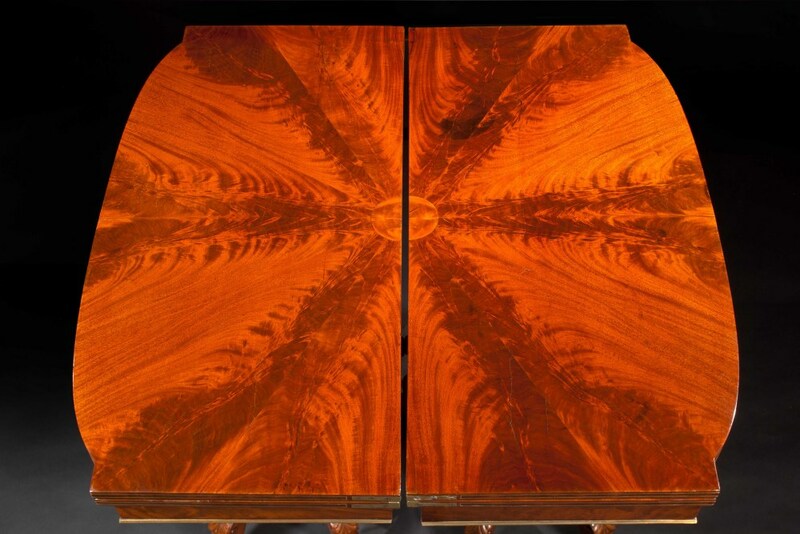 Re-finished with shellac in the manner of the period. 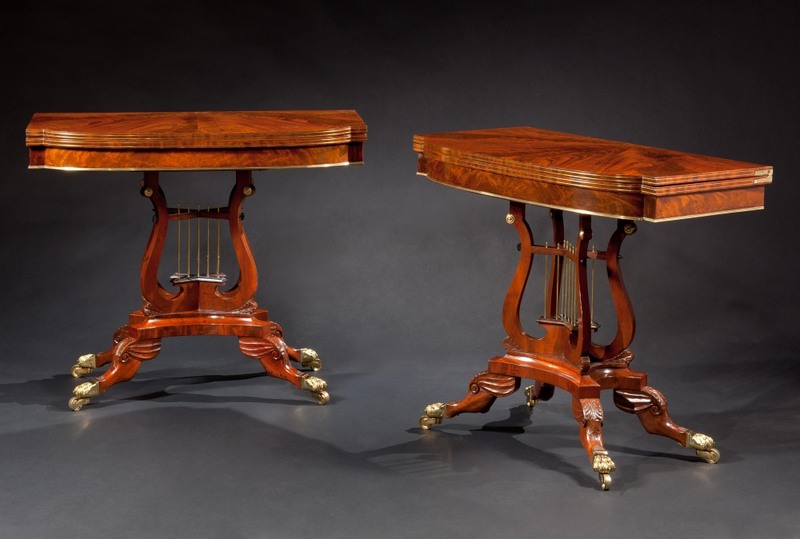 These crisscross-lyre tables with hocked legs are part of a group of tables by the same maker that include several work tables, card tables and two sofa tables, one illustrated in Jonathan Fairbanks and Elizabeth Bidwell Bates, American Furniture 1620 to the Present (New York, Richard Marek, 1981), p. 264, the other in a New York collection. 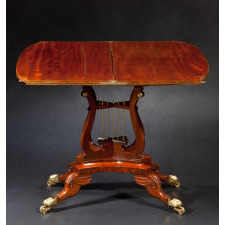 A games table by the same maker with a closely related lyre pedestal is in the collection of the Biggs Museum of American Art. The Edinburgh Book of Prices for Manufacturing Cabinet-Work, 1811, illustrates a "Lyre end for Sofa Tables" with a saber leg in pl. IV. The New York Book of Prices for Manufacturing Cabinet and Chair Work for 1817 notes that for table No. 32: each brass string [is] extra, 003[¢], and "When two lyres are crossed at right angles, the bridge and stretcher lapped together [are] extra, 026[¢]"; "All the above lyres considered with keys and points, in the start [price]," probably referring to a related New York-made card table with a crossed-lyre base is in the collection at Winterthur. Charles Montgomery has noted that almost identical detailed listings for lyre-base card tables were published in New York and Philadelphia price books. 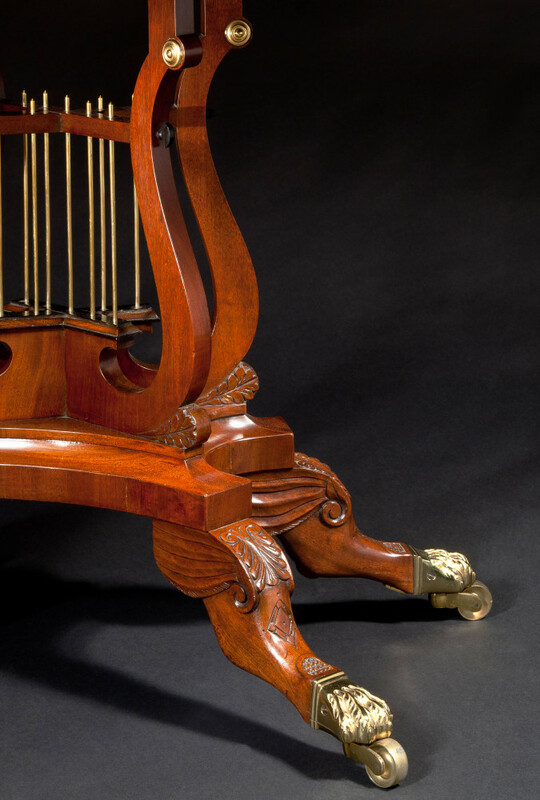 The Philadelphia Cabinet and Chair Makers' Union Book of Prices for Manufacturing Cabinet Ware (1828), # 3 on plate 2, shows a lyre design that corresponds exactly with the lyres on these table, no doubt, reflecting its use in this group of tables. 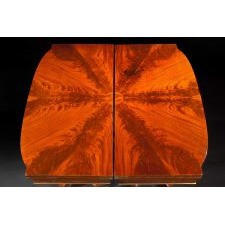 Jonathan Boor, Philadelphia Empire Furniture, (West Chester, PA., Boor Management, 2006), p. 188, fig. 63. Charles F. Montgomery, American Furniture: The Federal Period, (New York, Viking Press, 1966), p. 340-342.